We have been enjoying the wonderful music on FM Classic this week. Usually in the afternoons when the nosiy orchestral stuff starts up, Ian throws a tantrum and on goes the cds. But we have been indulging in listening to wonderful concertos as much as we can. Tonight, because we have been so busy today, we decided to have fish and chips and settle down for the last countdown. The last 5 were live although we only heard 1 movement from 5, 4, 3, and 2 which seems silly, especially as one was the Bruch Violin. The no 1 was the Emperor Concerto - I have lots of favourites but my very favourite is Shostakovich Piano Concerto no 2 which I did hear earlier on in the week. Our heads are full of wonderful music. In 2008 they will be running the top 100 chamber music. Look forward to it. All of the parcels which arrived while we were away turned up today - well, Ian to go and get them as they didn't turn up. 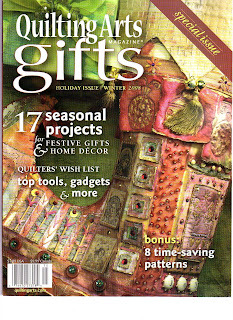 Included was the spiral stitcher which I swapped a flower stitcher for from Hilary. I am hoping to get to play with it over the weekend. Lynda (Purple Missus) had a pic of one on her blog earlier in the month. So no pics of holiday yet.... tomorrow! Even more exciting though was the fact that all the London boxes turned up this morning and all the lovely goodies I bought - mostly books - have been lovingly unpacked. We hardly had any stock left which is what we always aim for - silly to take stuff over and bring it back again. I try to offload anything onto Sarah..... So a few excitements to share before too long. 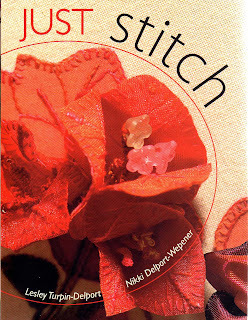 I had forgotten about this book 'Just Stitch' by Lesley and Nikki - lots of people in Australia will know Lesley as she has taught here quite often - I seem to have run into her over the years. It's a really lovely book - she and Nikki were at Ally Pally and whenever I felt sorry for my lower legs and feet I thought of the pain she was in.. Her words inside read 'to all who enjoy the inspiration of antiquity and the pleasure of stitching'. Isn't that all of us? I also brought back a heap of new Indian printing blocks. We have a few of the old ones left - about 15 or so which we are selling at a good price. See the web. Then we will load some of these - there are lots of different designs - big and little. And I also have these wonderful long silk ends - super for dyeing and everything else. In pastel colours - I will try to get Ian to load them for Nov special. We hope to get our specials up as fast as possible for Nov since we were away for October and we have all sorts of good things. As soon as the QA Gift mag has gone out. I am sure everyone knows it's more exciting to wait a few days rather than be up on day 1 of the month - too predicatble for words. Last night we went to a concert - not sure why really - large orchestral works from the Romantic period are not our thing. Anyway we got home about 10pm and ate very late with a nice red wine and slept right through until 7am so jet lag is over.... yeah! I have been ready to get up at 4am this week. I have stitched one of my 3 postcards knitting the sari ribbon but will wait until they are all finished and joined up before I post pics. Not sure where Ian has all the pics from Marrakech but wait patiently. 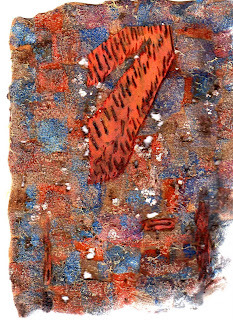 Managed a little exploration today - this is one for my rust book - I embellished wool roving - nice thick ones - onto some kunin felt and over the top some hand stitching and a layer of instant silk paper sprayed with Glitz Spritz - wanted to see how it went - and then chiffon (incidentally we brought back 100s of scarves and so full stocks again), and then attacked it with the heat gun. When you heat gun acrylic and wool you do of course get holes and burning cream wool. It's interesting though. Daylight saving has arrived - yeah - so the evenings are lovely and long and light. And the fence between our property and next door is all slatted up now so nobody can get in. 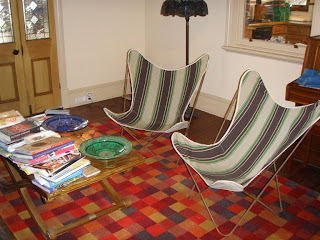 Considering some new chairs for outside. And Maggie - yes I think Contemporary Knitting is superb. Very inspiring indeed. My copy has already got smeary fingerprints all over it. All the bags are unpacked and away in the cellar - the goodies have all been returned to their old or new homes - depending. The boxes from Geelong Forum have opened, emptied and everything put away (they arrived just before we left for London) so the bedroom looks like a real bedroom (as real as ours could ever look), the kitchen likewise and the lounge - well see the picture below. Many thanks to everyone who has emailed with welcome home notes - we feel like we are back with friends and we have only been away for less than 3 weeks. gave me a lovely ATC - thanks very much - I have added it to my growing collection. Having completed nearly all the orders and done all the washing and checked out the garden - (I am pleased to report that the hydrangeas have recovered - I hope you are reading this, Val) I should be starting on my Marrakech Postcards for my workshop at Christopher Robin Quilts in Wanaka in Dec and a few other things which I have in my book to get on with. But - I started reading Ruth Lee's Contemporary Knitting book and rushed off to knit up some squares with the sari ribbon - I am going to play on the embellisher and stitch and stuff to create some big Indian postcards first. 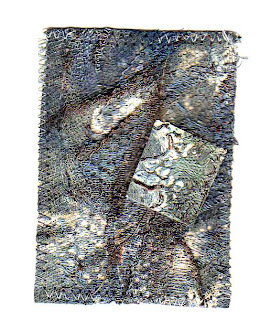 The scan is not marvellous but the sari ribbon has all sorts of hairy bits and the embellisher will have fun with this. Click on it to enlarge and you can see it much better. Off to play with that once Ian has sorted out what we are having for dinner. The travellers return. We left Heathrow 2 hours late - all set to go, captain chatty, doors closed and then somehow our luggage had not been loaded..... machine broke down, containers on, containers off, rejoin the queue. Bored clients. Off into the afternoon sun...... Arrive at Singapore nearly 2 hours late long past our connection to Perth but luckily there were lots of us and so another plane of disgruntled clients had to wait for us to rush on board with baggage l hour later. Sadly plane full to capacity so no chance of using points upgrade. Now have all these points and nowhere to go right now. I notice this morning that I can go business class to and from Bejing with my points - Ian can go but not come back.... Home safe and sound to rain and hail - lovely really. Happy grape vines but unhappy hydrangeas - they had been moved under shelter and missed all the excitement of rain. Being nurtured and spoken kindly to today. Washing done and suitcases all unpacked. Now starting on orders. Inbox is down to 15 but Ian still has all the answer phone messages to do and people seem to have discovered we are back and have been phoning orders all morning. When we left we locked our new gate so no-one could get in but of course the workmen next door let a couple of delivery guys in through their gate and over our wall where they haven't quite finished. You just can't win. 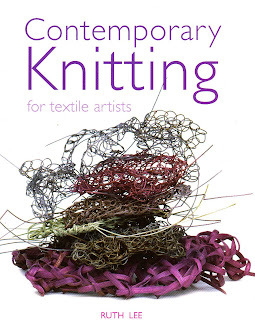 So a box of books was waiting for us - including this one - Contemporary Knitting. I had a lovely chat to Ruth's partner at Ally Pally and emailed the Aust suppliers to see if it was in Aust yet and it had just arrived. How is that for efficiency? It's a lovely book and I shouldn't really be reading it yet. Heaps of ideas for we who like to explore and experiment. We also brought back lots of this one - The Lustr'ed Cloth which Emily asked about. Very pleased to see this one in print. Alysn has produced some wonderful work using metals and stuff. Plus the 2 new Double Trouble books which some of you seem to already know about as you have already emailed with your orders. Now that Ian has a working watch (another new Swatch) I shall get him to work while he is wearing it. Watch the website for new books first! Cloth Paper Scissors should be here early next week too. Have to say I got a lovely bracelet in York so it was okay for Ian to have a second Swatch. We had a glorious time and loved Marrakech and I shall pop up some of my pics in the next few days. 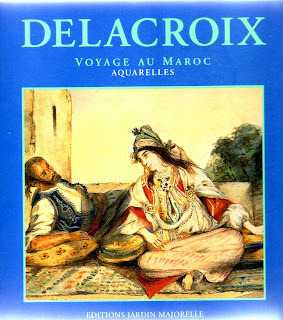 BUT - my best find was at at the Jardin Marjorelle which we both loved - walked into the bookshop and there was a book of the Delacroix Voyage au Maroc - in English. I have always loved his journals so that was special even if very heavy. To keep our suitcase weight down to approx 60kilos I had my usual very heavy backpack weighted down with precious books. I will share a few of his journal pages before too long too. Now off to work and back to checking on the hydrangeas. When we got home last night we went to GoGos for a super curry and stuff - was thinking about it on the plane whilst picking through my Qantas platter....... And then I will have to get to creating my pink distressed wall. Lots of good pics to get me started. Off to dinner with Annette, Terry and Grant tonight and flying off into the sky tomorrow - fingers crossed for our upgrade but it does sound like someone needs to bale out or die for us to get it. Never mind - be home on Friday. We went to York yesterday on the train and that was certainly a lovely day. Today was spent buying supplies and visiting the National Gallery. 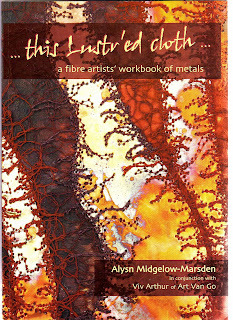 We have 3 great new books - the two latest from Double Trouble and a particularly wonderful one from Alysn M-M on metals. I think this is the best one I have seen on using metals and was delighted to see it at Ally Pally. Having a great time in Marrakech. Have managed to get lost in the markets and had to pay someone to take us back to our riad. Yesterday we went to the Atlas mountains where a very nice young man aka the guide pulled me all the way up to the waterfalls and somehow we came back with a carpet and 2 large plates. Meant to say yesterday how lovely it was to meet up with Lynda Monk at Ally Pally - you can even see a pic of Maggie and me on her blog and on Maggie's blog. And it was also great to meet Susan Lenz. Having finally made our way to the station to leave our bags and get out tickets for Luton, we are off to enjoy the rest of the day. Someone complained to me at Ally Pally because I hadn't posted on my blog since last Tuesday! I am only human, folks. We had a great flight over - got in at 5am and Ian got himself a suitable sim card and was anxious to use it as soon as possible. Phoned Grant to make sure it worked and woke him up of course. Got to Alexandra Palace to find our stuff had not arrived (what have we done to deserve this twice?) but 2 phone calls later(thank goodness for the mobile) and it arrived in an hour. The show was wonderful - met so many people it is like being amongst friends - Aussies and Artful Dodgers and old customers and people who seem to know me. Sold lots of stuff (that is the object of being there of course) and bought lots of new exciting things to fill some of the boxes which were basically empty. All of this will arrive back in Perth not long after that so watch this space (and the website). We caught up with Grant and Annette for a very nice night out at a Morrocan restaurant in Soho (in preparation for our trip) and I enjoyed catching up with Sarah (please have a day off my friend) - I wish I lived closer but then sometimes the excitement of once a year might be best or you would never have a voice! And I loved seeing Maggie and Val's wonderful work in the flesh. Took lots of pics so when we get home I will be able to show some. The exhibitions were great - we had the Pfaff one right near us and we both popped in and out a few times. It is a real treat to see all of the inspiring work. Today we had a do the washing and check the emails (1000!) and have a wander into town. Off to dinner tonight with Annette and Terry and Grant and possibly Lee. Tomorrow - who knows - we are on holiday. We go off to Marrakesh on Wednesday morning and we are looking forward to it. Can't post pics until we get home though. Bags nearly packed (I am quite good at this) and this afternoon we fly away into the sunset. Even though we have the points we have not been able to use them for an upgrade going over but we have put in for the return trip - fingers crossed for business class all the way home. Lots of lovely rain here and the 2 precious Luigi grape vines are growing very nicely. Bruce is in charge of the watering as it is predicted 31 here on the weekend and things get dry quickly. If all else fails he is under strict instuctions to save the vines or we will be dead meat. The rugby - not much more to say except that I still think the All Blacks are fabulous and I feel for the players - and I am pleased to see that the pasty Barnes (the ref) will not be involved in any more games this tournament. Go the froggies. I might post while I am away if I can but back on 26th - really looking forward to seeing so many people at Ally Pally including my good mate Sarah Lawrence and of course Maggie. And looking forward to all the exhibitions - it is a great show. Followed by the trip to Marrakesh - I have wanted to go since I was little. I have my sketch book, koh-i-noors and moonshadow mists (can't leave them at home) packed, my camera and my NEW mobile phone - yes we have a new one each and will now not be the ONLY people in London without a mobile phone. All these exhausting new skills. Second - all the emails and comments about the rugby. We watched England beat the Wallabies - that was a shock but not such a worry for us (I felt sorry for the players though)- came home for a couple of hours sleep - back up 2.30am and off to watch the ABs vs France. We haven't recovered yet - maybe the ABs will never recover. I feel so sorry for the team and the coaching staff - it was the best chance they ever had - they have worked so hard for 4 years and to lose. So many of the players are off to Europe where they will make lots of money and what will happen in NZ who knows. For me - I hope the French win the cup - they played with plenty of passion and have always been my number 2 team. Off to breakfast with Bruce and Kazuko - recuperation. 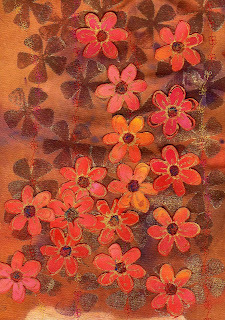 I will get back later with my embellisher/rust/stitch effort. Go see what Lynda from purple missus has been doing as well. And Maggie - she has been printing onto Lutradur. No time for me to try all of these things before Tuesday. I have been playing with Evolon. I have had a roll here for a while now but haven't had time to do much nor publicise it but it's pretty great stuff. From the same family as Lutradur but it is like a soft slightly fuzzy fabric - made of polyester and nylon. 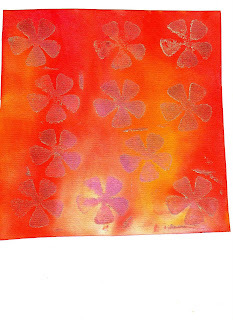 I painted it with Dye-na-flow and then printed on it with Lumiere and some of my flower stamps. Nothing very exxciting you may say but I also prnted on another piece and use the soldering iron (actually wood burning tool) to cut them out and then bonded them to the base fabric with the same tool. So they are free standing and 3D . Then I stitched a bit and in the centres with granite stitch. 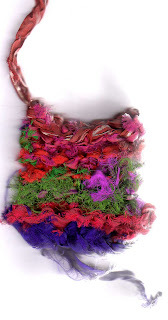 The whole point is that this has so much potential as it takes paints and dyes (well so do most things), is nonwoven, doesn't need a hoop for stitching, works well with the embellisher and won't fray etc and it likes to be distressed (don't we all?). You can also print on it which I haven't done yet but I will - probably not quite yet. Lynda on her blog has a picture of the original flower stitch foot which Hilary is very kindly sending me for a new one. I am looking forward to playing with it and seeing how it works and oiling it up so it will work. Big night tonight - Wallabies vs England first and then a wee few hours sleep and All Blacks vs France. Go the Wallabies first (this week only) and then special go the ABs. 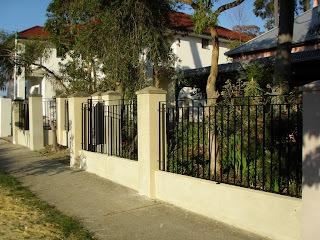 Here is our new fence with its iron palings/railings - doesn't it look pretty swish. I took some pics of Ian painting furiously yesterday morning before the iron men came but he wiped them off the camera. So I will have to wait until he finishes the rest of the painting. It certainly has changed its image. Front garden here we come but after London. This is the new gate with a lock and the giant letterbox. Have to say that the silly postie opened the gate and stuck the mail through the back of the box this morning and STILL folded the envelopes even though the opening is more than big enough. Feel we are definitely on a losing battle with this guy. The stump is one of our Eucalyptus trees. Sad when they have to be chopped down but this one keeps trying to pop up again. We are the only house around here with lots of trees and they sure make a difference in the summer. I cry inside when they have to go and we pay a fortune when we have them trimmed but what is life without trees? Lots and lots of birds around this year and a resident magpie in our garden as well. Thanks for your lovely comments, Susan. Look forward to meeting you at Ally Pally (and anyone else who comes). I do see my blog as a bit of a journal and if I only wrote about stitchy things, my family and non-stitchy friends wouldn't be impressed. I can refer people to the blog to see what we are doing, have been doing, and going to do. I will be back with the stitchy stuff tomorrow - I have been playing with Evolon - spraying it with Moonshadow mists and stencilling over that and I will attack it with my soldering iron. Plus I have the work following the photo from the other day to finish off. I want to complete and a couple of other things before we leave on Tuesday. I still have some packaging to do. Jacinta sent some glorious mulberry silk/15 micron merino mix and it is quite yummy. I have a scarf a friend of hers has made for my display so we will be pretty colourful at the show. Big weekend of rugby coming up with games at 9pm and 3am....... Little naps in between I fear. But off to sit on the verandah and watch the world go by through our new rails! By the way - if you want any stock you need to order by Monday - we will not be posting anything out after Monday until we get back on 26th October. Contrary to what some people think - there is no other staff to attend to your every need while we are away and when we lock the new gate on Tuesday only Bruce and Kazuko will have the key (so they can come and water). 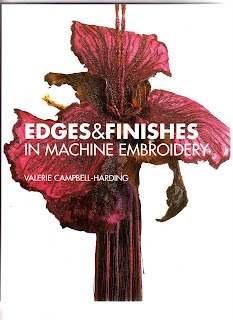 Aussie Jo asked about Edges and Finishes - it's one of Val C-H's book - and one of my favourites. So much exciting information -it's usually by my bed for last minute reading before I go to sleep (along with a stack of other books). It has a great section on the flower stitcher and I always love the braids Val has made. She has another book I refer to a lot - Machine Embroidery Stitched Patterns and Machine Embroidery Stitched Techniques was what I used to teach myself free machine embroidery- sadly it is out of print. I love Maggie's description of new feet for old - and if it brought Constance Howard back that would be something. I was lucky enough to meet her and talk to her when I went to London when I finished C and G Part 1. 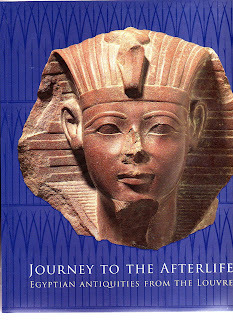 On Sunday we went to the Egyptian exhbition at the art gallery here. It was excellent. I bought the catalogue as you couldn't draw or take notes. Triggered off a few new ideas for my Frescoes and Fragments workshop in Melbourne in January at the Embroiderers' Guild Summer School. Mostly in the fragment area. My computer is driving me nuts. The ram is not available yet so I have different crashes every day. Word yesterday so I have had to transfer all my Playways files to the main computer so I can access them. Today it was firefox and pdf files. 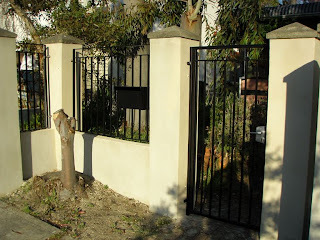 But - our lovely new wrought iron is all installed in the front fence along with a very nice gate and a super large letterbox to hopefully please the grumpy postman. I took some photos this morning and will take some of it finished and pop them up tomorrow. My creative work has been slow today but probably because the computer has been bugging me. Off to dinner with Eva and Malachy tonight but first a wine on the verandah to enjoy the handiwork. Ian had to get up early to paint the parts where the iron goes - he will finish it in the weekend. Sadly my mother is not doing well at all and I think nearing the end. Unfortunately I cannot be there - I saw her last in February so good memories - she enjoyed my visit. This is one of the pictures I took at the yacht club earlier this year - I am working on a piece around it mostly on the embellisher - should have it finished tomorrow. 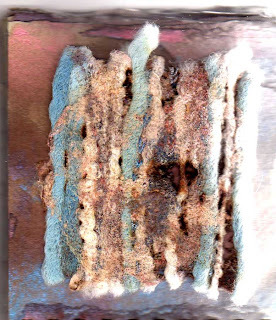 I love the blue that appears - in most of the rust stuff people are doing they don't have that blue - Jacinta has threads and fibres dyed under Warrandyte and I also am using my Autumn Victory rayon thread for machine stitching. It is interesting how you find colours which suit what you are doing and the little extra colour makes all the difference. Don't you love the rusty nail sticking up. Nest door today at the flats being developed, they put in the iron sliding gates - our iron man is coming tomorrow to put in our iron thingies and our iron gate so Ian was out this afternoon painting the wall. Have some pics tomorrow. Customers coming complain that there is no No 6 on our gate but we are next to No 4 and we will have a new 6 before too long. At least the postman should stop whinging. I am also playing with the new lutradur - it is called Evolon but it is like a fabric trying to be a paper or a paper trying to be a fabric. Soft to feel and great for stitching, printing and burning out. Should have something to show tomorrow. I am hoping to attack it with my soldering iron first. When I was in Geelong at forum, Hilary asked me to come and show her how to fit and use her flower stitch foot - she has a Husqvarna Lily and we now know it works very well on that model. 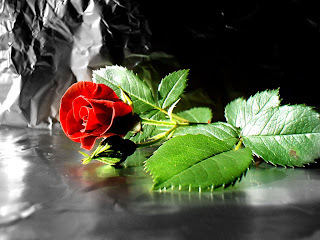 - I found that article particularly good and also Edges and Finishes has lots of great stuff on the flower stitcher using water soluble. I have sent my article to the Aust Machine Embroidery (and textile art in the title don't forget) and Yvonne tells me it will be in the January issue. The other excitement is Quiltwow - Maggie's new Quilting zine. The taster is up for everyone to see. I am not, as most people know, a quilter (I made one once) but I can appreciate the fantastic extras that now engulf the quilting world. Do go and check it out. Nothing as exciting as a creative picture or even a boring picture today. I have been packing the boxes for London. It looks like an easy job but in fact I have to think and count and refer back to last year and look at what I have found etc etc. I have sort of finished now and the boxes will go off early tomorrow but I still have a lot of things to wind and package - as usual I am behind but also I have just found new things. Pauline asked what was I bringing - well threads and fibres and stuff - all the lovely bright colours we have (and a few pastels) - a beautiful silk lap dyed by Jacinta in Indian Splendour which I will use for display. It doesn't matter how many baskets we bring it is never enough - we run on Murphy's Law. Talking of Murphy, Argentina beat Ireland in the rugby and the All Blacks play France in the quater final in Cardiff on Sunday morning. Being a worry wart I won't be rested until the game is over but Bruce is far more confident. I emailed the Riad in Marrakesh where we are staying this year after the show to confirm and Brigitte who I 'talk' to watches the rugby too. I will have our lovely new Embellisher bundles - fine merino wool which make a good base or layer for the embellisher. I meant to take a pic but they are all sealed up. I also found some wonderful long silk ends in pastel colours which will be great for dyeing. SO all those coming to Ally Pally - see you there. As a reward we are off to GoGos I think, for dinner. Tomorrow I am anxious to get into the studio because I have some things I simply must get to try.